Let the games begin! 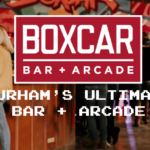 Our third location in downtown Durham, NC is now open!Located at 621 Foster Street, our newest location overlooks the historic Durham Athletic Park, at the corner of Foster + Geer Streets and offers over 70 arcade games, a full bar including 24 craft American drafts (and featuring a wide variety of local beer, liquor and wine), private event space and a Neapolitan-style pizza kitchen. A sizable covered, outdoor seating area, which overlooks Durham Athletic Park, gives you a front row seat to the games. Check out our live-streaming draft menu, request to book your special event in our 1,500 sq foot dedicated, private event space, see our arcade games lineup and check back soon for daily specials & events.